Braden King’s romantic road-trip drama HERE, filmed in Armenia, was accepted into dramatic competition at The Sundance Film Festival where it will make its worldwide premiere in January 2011, with an anticipated screening at the Golden Apricot Film Festival in Yerevan in July 2011. HERE represented the first time that a feature length, English-language, American film was shot entirely in Armenia, with the Armenian and International cast and crew filming throughout the country including Yerevan, Jermuk, Kapan, Meghri and into Nagorno-Karabakh. Scenic landmarks used as locations include Tatev Monastery, Gandzazar Monastery and Dadivank. The film stars Ben Foster (3:10 TO YUMA, THE MESSENGER), Lubna Azabal (PARADISE NOW), Narek Nersisyan, Yuri Kostanyan and Sofik Sarkisyan. HERE is a dramatic, landscape-obsessed road move that chronicles a brief, but intense, romantic relationship between an American satellite-mapping engineer (Foster) and an expatriate Armenian art photographer (Azabal) who impulsively decide to travel together into unchartered territory – both literally and metaphorically. 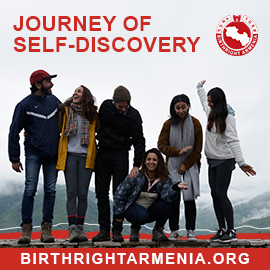 “We are thrilled to be embarking on this groundbreaking journey throughout Armenia with an extraordinary cast and an international crew. It is our hope that this totally unique, award-winning project will help to re-define and expand the borders of contemporary independent film” said producer Lars Knudsen, prior to production. In order to complete the film in time for the Sundance Film Festival in January 2011, the filmmakers are seeking tax-deductible contributions at their website: www.herefilm.info/contribute/. Limited edition prints of the Tatev Monestery are available for the tax-deductible donations of $5000 or more. HERE has been supported by Robert Redford’s Sundance Institute, Robert DeNiro’s Tribeca Film Institute, the Cannes Film Festival Atelier, Creative Capital and supported by the Armenian Film Center in Yerevan. The filmmakers have pledged to donate a percentage of net profits support young Armenian filmmakers.